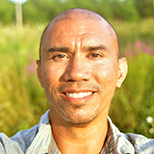 Brandon Keim is a freelance journalist specializing in science, environment and culture. He's a frequent contributor to Wired.com's award-winning Wired Science section. His work has also appeared in The Christian Science Monitor, USA Today, Seed and many other publications.